Every year Christmas music seems to encroach on us earlier and earlier, we see the decorations in the store and hear the music over the speakers. Even those who are driven nuts by this perpetual holiday, must admit how infectious Christmas music really is. Even if you do not particularly celebrate the religious aspect of Christmas, or the Winter Solstice, it is difficult not to tap your foot and hum to the best Christmas songs out there. When it comes to playing Christmas music, there may be no better instrument than the ukulele. After all the ukulele is already associated with fun and smiles, add some catchy tunes into the mix and you have a winning combination. The earlier Christmas music of chants and psalms, really aren’t the best for the ukulele. A piano or a harp is more suited for some of the more traditional songs. The 1930’s – 1960’s were particularly a great period of Christmas songs. This was the golden age of radio, TV, and movies when creativity was at its peak. If you notice, there haven’t been to many great memorable Christmas songs written in recent times. This 30’s to 60’s era gave us a mix of jazz pop standards and early rock n roll tunes. Pop standards have a tendency to have more complicated expanded chords used in jazz, which may not always translate to the ukulele very well. However, the songs with rock n roll backgrounds rely heavily on common chord progressions and 7th chords, remember back to our music and song theory 7ths are the backbone of great pop and rock. Below is a list of some of the better Christmas songs that are perfect for the ukulele. This the quintessential ukulele Christmas song written in 1949 by Robert Alex Anderson. The most famous version of this song is by Bing Crosby and The Andrews Sisters. As the song states Mele Kalikimaka is truly the Hawaiian way to say Merry Christmas. The chords are not too difficult and can easily be transposed. If you have trouble remembering the Ebdim7 it is fingered 2323. It takes a little practice switching the chords that fast, but once you have it down, it sounds great! This famous Christmas song was co-written and performed by Gene Autry, the singing cowboy on radio, TV, and the movies. [G7]Right down Santa Claus Lane. [Dm]All is [G7]merry and [C]bright. 'Cause [Dm]Santa Claus [G7]comes to[C]night. 'Cause [Dm]Santa Claus [G7]comes to[C]night! This song isn’t too difficult on the ukulele, the hardest part being the switch from the F chord to the Em. This is a fun song to really play around with, once you have the chords down try strumming it in different fashions, a little bluesy, or rockin’, or even a little funky with a muted strum! This song was another Christmas song made famous by Gene Autry (when it came to holiday songs, he really cornered the market). You would even say it [C]glows. [D7]Won't you guide my [G7]sleigh tonight?" You'll go down in histor[C]y." This well known tune became an instant hit when released in 1934. There are many versions out there, possibly the most famous is Fred Astaire’s from the film of the same name. This version above is a little more bluesy than the simple original, the added 7th’s and diminished chord spice it up a little bit. If you need a quick reminder the G#dim7 is 1212. And the Fm that works best is the one fingered 5543. This song was written by Sammy Cahn and Jule Styne in 1945 during a California heat wave, how ironic that such a Christmas classic could be written at such a time! My favorite version happens to be the Dean Martin one from 1959. [Abdim] Let it [C]snow, let it [C7]snow, let it [F]snow. And I brought some [Abdim]corn for [C7]popping. How I'll [Dm]hate going [G7]out in the [C]storm. But as [Gm]long as you [D7]love me [Gm]so. For a reminder Abdim is 1212 and C#dim is 0101. If you remember the diminished chords on the ukulele are all very similar to one another as you have noticed so far from these songs. This song was written by the British songwriter Tommie Connor and one common version of it is by Jimmy Boyd. The chord G+7 is fingered 0312 and makes a great finish to the song when ending on the C chord! Jingle Bell Rock was written and recorded by Bobby Helms in 1957. While we can’t quite make the intro on the ukulele as perfect as on the electric guitar, it still is fun to play and everyone will recognize it! This song looks a lot more complicated than it really is. The opening line is simply played on the bottom string, switching between the C, C6, and Cmaj7 is all very simple. And the other diminished chords and +7’s fit right in very easily while playing. This song is a great example for new players on how sometimes chords look harder than they really are. Once you start to look up these chords you will find it is really within reach of an intermediate uke player! Of course there are many more Christmas songs out there to play, but I choose these above for a reason. Do you notice how they are all made up of the same chords essentially? Just as different genres have their specific chord progressions, so do Christmas songs. The holiday songs that will sound best on your ukulele will have 7th chords, diminished chords, and other additions to them. Even if you do not particularly care for Christmas tunes, it is wise to learn them. They are great songs that show you how to start growing your chord knowledge. Instead of playing simple C, G, and F songs, you will really advance when you start adding in Abdim, G+7, G9ths, and C6’s. Go ahead and look up some other Christmas songs you like and you will notice many of the most popular ones have these same chord themes! If you do prefer the more traditional tunes that are more suited for Christmas carols you can give some of these a try: Christmas Carol Uke tabs. Songs like Jingle Bells, Deck the Halls, and Silent Night are a lot simpler on chord progressions than the pieces mentioned above. They are good songs on the ukulele to learn for caroling and Christmas sing-alongs. A couple other great Christmas tunes are I’m Dreaming of a White Christmas or if you feel up to the challenge You’re a Mean One, Mr. Grinch. Mr. Grinch is definitely not an easy song; you have to take it step by step for chord switching. If you are looking for some further ideas on which Christmas songs to play listen to a few pieces and get inspired! 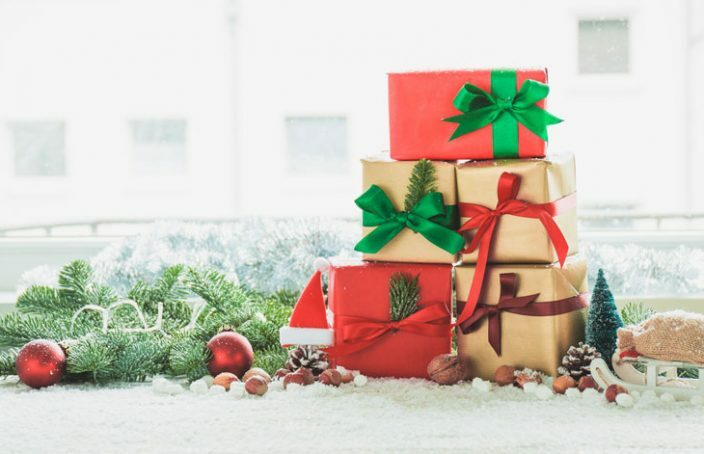 Featured Image (Christmas photograph) designed by Freepik.